Having a dog that suffers from this condition is something that can unfortunately happen to all of us and not just those complete so and so idiots who leave their dogs locked inside a car on a stinking hot day! I know, because it happened to my own dog, Emily, many years ago and it was entirely my own fault. It could have been tragic if the Jennings’s Homes headquarters in Mulgrave didn’t have a large ornamental pond outside its front entrance at the time. Emily was a Pug owned by myself and my first wife, and her best friend was our Hungarian Vizsla called Macy. She was about 5 years of age, fairly fit and certainly not overweight. She loved striding alongside Macy on our occasional walks around the block in Mulgrave. It didn’t seem particularly warm that summer evening and she always panted on her walks, she was a Pug after all, and she always pulled ahead on the lead to stay shoulder to elbow with Macy, so I wasn’t too worried. Then she suddenly stopped and was really gasping for air before falling over. We thought she probably just needed a rest but quickly realised that her gum colour was a very deep red and she was really heaving her chest and making a terrific noise with her breathing, which wasn’t really regular. We picked her up and it felt like I was holding a hot toaster that was about to pop. It happened so quickly and we were still about a kilometre from home. What I’m sure saved her life was that we had stopped right next to the deep ornamental pond outside Jennings’s Head Office and so Emily had an instant unscheduled bath. We submerged her body in the cool water and she gradually returned to her usual noisy breathing and she regained her pink gum colour. She had a drink and was ready to take her usual position at Macy’s left elbow but instead was carried the rest of the way home. We all know that dogs can’t dissipate excessive body heat as well as we do. They can’t sweat and instead rely on exchanging heat via their saliva moistened tongues as they pant. You can’t continue to do that as you become progressively more dehydrated producing lots of saliva and rapidly panting while your body temperature reaches 42 degrees Celsius and beyond where cells throughout your body start to undergo necrosis. Your cells die because at these temperatures the cellular proteins become denatured (disintegrate) along with their metabolic enzymes and cell membranes. Every body organ and system will be affected, including the nervous system where brain swelling can occur causing seizures and eventual coma, the cardiovascular system where dehydration will lead to cardio-vascular shock and myocardial (heart) necrosis, the gastrointestinal system where necrosis of the gut lining can cause haemorrhage and allow bacteria and their toxins to enter the bloodstream and cause endotoxic shock, liver damage and also muscle damage where the muscle proteins released into the blood-stream can contribute to the blockage of the kidney’s blood filtering tubules and so cause acute renal failure. Meanwhile your blood cells are coagulating together and turning your blood into sludge that hastens inevitable death due to multiple organ failure. Our dilemma is that Griffons are one of the brachycephalic breeds that because of their shortened noses and muzzles are already compromised when they try to dissipate heat when panting on warm days. An older or overweight dog will be even more susceptible. Prevention of this occurring is relatively easy. Providing shade if the dog is outdoors along with plenty of cool drinking water. Heavy ceramic drinking bowls kept in the shade will often be more effective than plastic or metal bowls. We have some rather delinquent Japanese Spitz’s in our household that seem to enjoy paddling their forefeet in the water bowls they share with the Griffons resulting in their rapid depletion on warm days. We countered this by using some two piece plastic non spill water bowls which are also useful to have in the car when travelling with the dogs. Another option at home would be an automatic refilling water dispenser that is attached to a garden tap, but I’d still provide a water bowl in case of a malfunction. Those cooling dog vests and especially dog mats that contain crystals which form a cooling gel when activated after soaking in cold water are very effective and useful when attending dog shows during the warmer months. Of course, one needs to avoid vigorous or unaccustomed exercise on warm days and never leave a dog in a stationary car on even a mildly warm day even if the windows are left open. However, if you find yourself in a situation where a dog is displaying signs like anxiety, panting, excessive salivation and congested membranes (red rather than pink gum colour) that indicate early stages of heat stress then you need to act quickly to cool the body down while someone contacts an emergency veterinary clinic. Get the dog indoors or into the shade if outside and cool the dog down by either immersing the body into cool water or alternatively hosing or repeatedly applying soaking wet towels to especially the abdomen and chest. There are large superficial blood vessels just under the skin surface of the relatively hairless underbelly region of the abdomen and axillae (armpits, and yes, I know that dogs don’t have arms!). 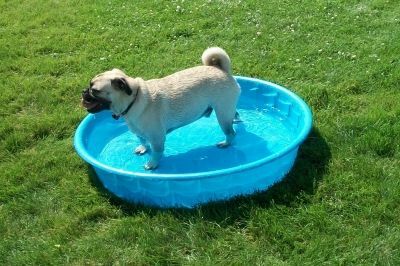 Cooling these areas is the most effective way of reducing body temperature if a cool bath is impractical and when you are transporting the dog to the emergency vet clinic. Many vets will use methylated spirits to douse these same areas which is even more effective than water to dissipate heat away from the body. Do provide cool water to drink but don’t try to force the dog to drink. The dog will be de-hydrated and water will help remedy this but intravenous fluids administered at the emergency vet clinic may also be necessary, especially if the stomach has been damaged and the dog is unable to keep the water down. Even if the dog shows improvement and isn’t progressing to the more advanced signs of heat stress, you should still visit the emergency vet clinic. Why? Because your vet can better assess the dog for other signs of shock and especially renal damage and may recommend intravenous fluid therapy to counter both of these complications. Many dogs have seemingly recovered from heat stress with home and sometimes veterinary treatment to only suffer renal failure a day or two later. The latter signs of untreated heat stress include progressive respiratory distress, haemorrhagic vomiting and diarrhoea, collapse, seizures, sometimes falling into a comatose state before death. Remember to regularly replenish those wet towels applied to the underside of the dog and don’t make the mistake of actually wrapping the dog up inside a cocoon of wet towels. You would be amazed how warm those towels can become and if the patient remains wrapped up inside them then they’ll actually start heating up again because you have just created a layer of insulation around an already overheated dog. Emily reached the age of about 16 years, thanks to Mr. Jennings and I didn’t even write a note of gratitude! Dr. Iain Mitchell, B.V.Sc (Hons), M.A.C.V.Sc.